Blake Backlash submits his first dispatch from this year’s Glasgow Film Festival. ‘Who directed Goonies anyway?’ someone asks in Noah Baumbach’s While We’re Young. I was unable to stop my mind smugly providing the answer to that question but – unlike the bloke three rows behind me in the Glasgow Film Theatre – at least I managed to stop myself saying it out loud. Or so I thought. At the party afterwards my viewing companion told me I’d whispered it under my breath. The film has fun playing with the idea that your attitude towards The Goonies says something about how old you are. For Josh (Ben Stiller) and his new-Dad mate (Adam Horowitz) it’s just a crappy movie they maybe liked as kids. Jamie and Darby (Adam Driver and Amanda Seyfried) are about twenty years younger, and for them it’s a classic they genuinely admire. Josh initially finds their enthusiasm stimulating and liberating – ‘they don’t distinguish between high and low’ he says, defending them. But as Josh and his wife Cornelia (Naomi Watts) become closer to the younger couple, insecurities and hidden agendas start to surface. When I previewed While We’re Young on MostlyFilm I worried that it might contain too many Ben-Stiller-wears-a-hipster-hat jokes. But the film seems to get most of that out of its system in a montage. And what comes after that is a kind of argument about notions of authenticity and integrity. At one point two people literally have an argument about those things, it’s that sort of film. And I liked that – it gave me a film that was chewier than I anticipated. The film contains pleasingly real and unsettling patches of darkness, lines that tell of how so much of life is spent feeling unfulfilled, regretful and disappointed. If Frances Ha was about how a young life can take so long to climb clear of its wrong beginnings, While We’re Young has the courage to suggest that we can get lost half-way through our own stories, unsure if we’ll ever find the thing we’re looking for, or think we are. Gregg Araki’s White Bird in a Blizzard also deals in disappointment. 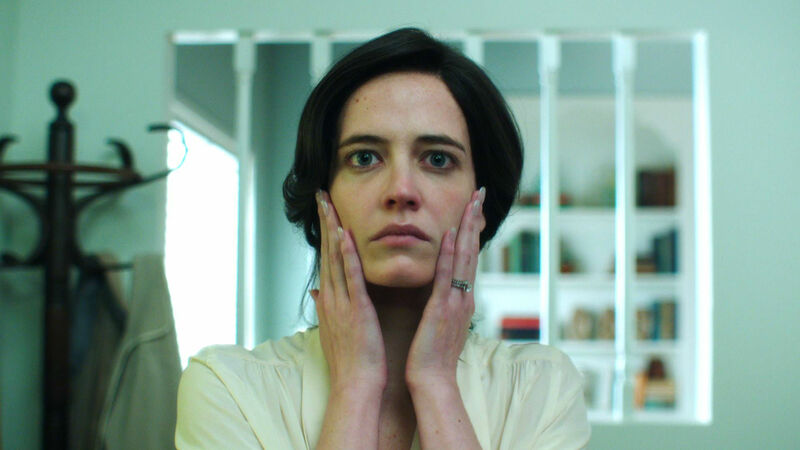 Eve Conners (Eva Green) seems cornered and drained by suburban home-making. Green’s performance is extraordinary – it’s as if the film, as well 80’s suburbia, could not contain her. Mascara and eye-liner black as despair, the touch of old-Europe in her accent: there’s something Gothic about how she plays Eve, a Hammer horror production of a Richard Yates novel. The fact that the film is built around her disappearance seems almost natural, like someone so out of place would have to evaporate away. This is a film full of of frozen imagery but the narration makes more than one reference to women melting. By the time we find out why Eve has actually disappeared, we’ve seen a couple of plots twists and listened to a lot of 80s new-wave music. Which is to say, I had a pretty good time even if nothing in the film ever quite seems real or convincing. I’m not sure it’s supposed to. The look and tone of the film may reflect how Eve’s daughter Kat (Shailene Woodley) sees the world and in particular how she sees her father (Christopher Meloni). But if film is a subjective vision, built around a weird absence, it contains four very grounded and charismatic performances from four young actors (Shiloh Fernandez, Gabourey Sidibe, Mark Indelicato and, especially, Woodley) that make you care about what happens. Catch Me Daddy also has a kind of absent parent at its heart. Daniel Wolfe’s film is about Laila who has left her brother and her father, Tariq (Wasim Zakir). Tariq is, for most of the film, a silent presence seen in shadows in gloomy and empty take-away. There is a lot of silence in the film, as its opening moments unfold we are left to infer what the connections are between two the two white men and four Asian men who seem to be looking for Laila and her Scottish boyfriend (Connor McCarron). When people do talk, the script by Wolfe and his brother Matthew shows a keen sense for the half-profound absurdities of everyday speech. There’s a taxi driver played by Shahid Ahmed, who has a great monologue that starts off funny, true and a little random – then ends somewhere more darkly connected to the film’s plot. For all that it is taciturn, the film is also beautiful. But it’s a kind beauty that felt familiar, and for me perhaps over-familiar, from recent British cinema. I feel like I have seen these stark, misty and chilly places outside of town before, seen other similarly exquisitely framed tower blocks and back closes. Wolfe’s vision was most distinctive when it captured ugly things, lonely and awkward looking animals behind glass and in cages, the sweaty- sheen on a disgusting looking donner kebab. Which reminds me that before I go I need to tell you that The Goonies was directed by Richard Donner. I also need to tell you that, while I am conscious I may have made these films sound gloomy, every single one of them made me laugh out loud, and not just briefly. That doesn’t happen that often these days even in comedies. Finally, if you are curious to know what your own attitude towards The Goonies is these days, then you should know that it is playing in the Festival too. The Glasgow Film Festival continues until the 1st of March. There will be more about it on MostlyFilm next week.